WARNING: If you have ever signed up at Aether Force's website, you need to read this... your name, email, password, etc... information has been compromised because Techzombie sold his own database for bitcoin!!! Yesterday, it has come to my attention that Mohamed Youssef (Rayam Azab Youssef aka Ray Savant aka Techzombie) is accusing me of using funds from Eric Dollard's campaign to hire Turkish hackers to break into the Aether Force website. Every dime that Eric Dollard's campaign earned for EPD Laboratories, Inc. has only been spent on the seismic project, period. Justin, the secretary/treasurer of EPD Labs has all the records to show this and being a 501(c)(3) charitable non-profit organization, the financial records will be available for public review after tax time for verification. Here is what Mohamed Youssef says on his phony Eric Dollard site since February 2014, "Our ISP has tracked down the hackers and a report is being filed with the FBI. part of a much bigger report. This guy is going to prison… AGAIN… This is the second time Aaron Murakami has commissioned hackers to attack one of our sites. 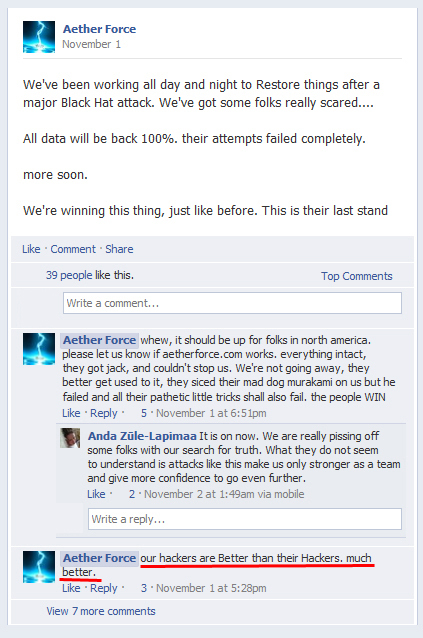 He paid hackers to attack aetherforce’s keychests.com account. He used Turkish hackers for that attack and it will also be documented and sent to the FBI." Prison AGAIN? I've never been arrested and have never been tried or convicted of any crime in my life. The only time I've seen a courtroom is two times on Jury Duty - one was in the last year or so, which would be impossible if I were a felon and a few times in court to mitigate some speeding tickets so the fine would be reduced. These slanderous allegations are serious and he will suffer legal consequences for this. Not many people know the serious investigation going on in regards to all of this and each time Mohamed Youssef opens his mouth, he keeps digging himself a deeper hole that he can't climb out of. Such is the life of a pathological liar. They have no continuity of thought so they have a long trail of contradictions and the only thing they can do is to pile one lie on another hoping to distract people from actually looking at the facts. Early in November 2013, we purchased some mailing lists from Techz of Aether Force and became very disappointed. 1. Techz claimed that he had a good mailing list that he was willing to sell that had almost 4000 contacts who were interested in alternative science & energy. 3. After sending Techz some Bitcoin for our purchase, we found that over 95% of all the people on the list were fake spambot accounts, which he used to artificially inflate the membership numbers at his website Aether Force. He actually only had a couple hundred legitimate registrants although he claimed his site went "viral". Upon further research, about 20% of the non-spambots were actually Techz accounts under different usernames. 4. The "original content" was loaded with nothing more than a character assassination campaign against several individuals - and we were told it was quality content covering all kinds of alternative science & energy topics. Techz was literally trying to get us to repost his attack campaign against Eric Dollard by passing off the posts as "original content" dealing with alternative energy and science. 5. Furthermore, we found that he had been accusing other websites, people, etc. of suppressing information. However, he accidently gave us a full backup of his Aether Force site, which included several pages of posts from his own users that he was censoring; especially, anything that disagreed with him or his character assassination campaign against others. 6. Included in the Aether Force files that Techz provided us, he also accidently included a few scripts that he had that captured the member's passwords as they were submitted, which bypassed the WordPress encrypted password system. We are deleting the passwords for all the users but will include the normal WP database and a spreadsheet of all the users everyone can see if they are on the list of users with compromised passwords. If your name and email appear in this list, we recommend to IMMEDIATELY CHANGE THE PASSWORD of any account that you have that uses the same password as what you used in Aether Force, immediately! To verify the database file that is included in this zip file, simply install the db to a wordpress site and it will be the aetherforce.com site as it was in November, 2013. Also check the Wayback Machine during that period and you will see it is identical. We will never get our Bitcoin back for this scam transaction by Techz but we can prevent anyone else from getting ripped off. We weren't going to bring this public but just recently as we were going through our files, we found that script that duplicates the submitted user's password in a non-encrypted form. That was when we decided to come forward with this for your protection. We are stumped as to why he provided us with all these files instead of just a mailing list and word doc with articles. We are only interested in mailing people about our energy saving products and don't want to get involved in the personal quibbles amongst the alternative energy community. What is also disturbing is that we also received a folder entitled "Arch Aether Mages", which had a folder for various people involved with alternative energy, politics and so on and one of the folders was dedicated to Adolf Hitler of all people. There actually weren't any files in this folder, just a bunch of website shortcut links to all kinds of Hitler propaganda, photos, videos, books, etc... he seems quite obsessive about Hitler and propaganda. Techz only knows us by our anonymous handle that we used to communicate on skype and all Bitcoin transactions are encrypted and anonymous. We predict that Techz will deny our claims and will make his own counter-claim that some hackers must have broke into his site and orchestrated all of this. But if hackers were able to get into his encrypted password protected site, what else were they able to get into that belongs to Techz? That is a little splinter for his mind as he loses in both cases. The Aether Force members will believe that Techz did sell out their contact info for a quick Bitcoin or they will believe that some hackers broke in. In both cases, Techz is exposed as a fraud for having a website with over 95% fake users and is exposed as a fraud for accusing others as suppressing information while he censors his own user's posts that disagree with him. If you want to purchase mailing lists for any particular topic, there are plenty of places that sell qualified lists as well as royalty free articles. You don't have to get ripped off like we did so stay away from Techz. I actually checked out the database and uploaded to a private site to see for myself and the above linked to zip file is indeed the Aether Force website as of November 2013. What is interesting is that is has all the messages that Mohamed Youssef suppressed, while claiming I'm some suppression agent and one person that he suppressed was actually David Webster. please look through it to see if your name is on it. If it is, make sure to change all your passwords on all your accounts if the passwords you used was the same as what you used at Aether Force. Wow - he makes some bogus claim about hackers doing this when he claims his hackers are better then their hackers: He has hackers??? When Techzombie went by Ray Savant instead of Mohamed Youssef, he was the CEO of a company called Funhi.com that apparently did really well to the tune of over a million dollars. The money was made selling nothing more than virtual gifts that members could gift each other. Funhi.com is an old social network website owned by Ray Savant who is Rayam Azab Youssef aka Mohamed Youssef aka Techzombie of Aether Force. You can see that even way back, he was spying on his members' private messages even though his website told his members, "Your privacy will not be infringed on in any way." "Elsewhere, FunHi (www.funhi.com), with more than 150,000 active users, seeks to emulate a club and "bounces" users who lack style, like "meatheads" and people who "look homeless," according to Ray Savant, the site's co-founder. He estimates the site has bounced 20% of aspiring members. The site changes its invitation policy every few weeks." Looks like Ray Savant (Techzombie aka Mohamed Youssef) has always had a problem with homeless people - even had a social network where people who "look homeless" got kicked out. We all know how he has treated someone else who is essentially homeless and has lived out of his car off and on for the last 24 years!